Born in Bourgas. At the age of only six, Emil showed great interest to the violin lessons which his sister took at that time. He loved listening to classical music. The really peculiar thing about the boy was that he used to wave a pencil as if conducting an imaginary orchestra. His debut as a conductor though, was with his school choir. He studied in the Sofia School of Music, and he further continued his music education at the Sofia Conservatoire. His idol used to be Herbert Von Karayan. I did my best to meet him in person, Emil once confessed. And he succeeded; they first met in Salzburg in 1970. The audience and connoisseurs were taken aback by the brilliant musical memory and talent of the young Bulgarian. Karayan found his successor, the Austrian press wrote. Soon Emil Chakarov became the Maestros apprentice and later - an assistant of his. 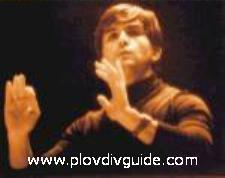 He become a conductor of the Plovdiv Philharmonic Orchestra in 1974, which he did until 1978. Some years later he accomplished another dream of his - a New Years Christmas Music Fest at the National Palace of Culture in Sofia. He held the world stage triumphantly till 1991. He conducted his last concert on March 22, 1991 in Paris. He passed away in Paris on August 4, 1991.